The other day I received a link from the great Laura Aiken and her linked directed me to Tom and Saundra Synder's Designer Glass Mosaics. 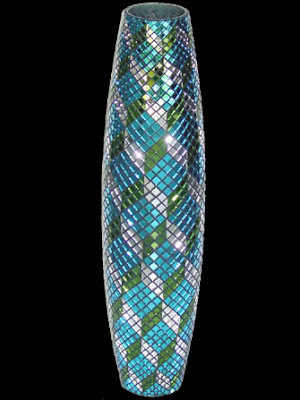 Tom and Saundra have a Charlotte, NC- based glass studio and together, they produce commissioned glass work work like nothing I have ever seen. 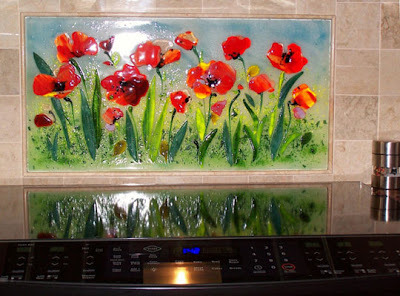 The Snyders do a lot with fused glass. 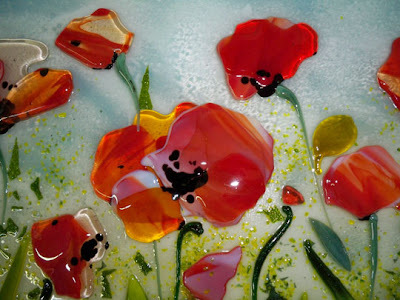 Fused glass is the technique of layering cut and powdered glass and then putting it into a kiln so the layers can melt and fuse together. The result is a glass with dimension and intense color saturation. Many of their pieces take on the feel and depth of a carved relief. 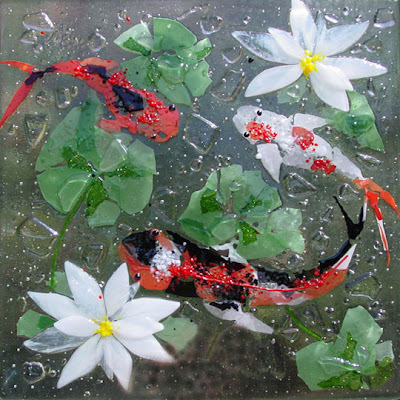 I've seen fused glass used in art pieces, but the Syders are pioneering a whole new direction in fused glass. 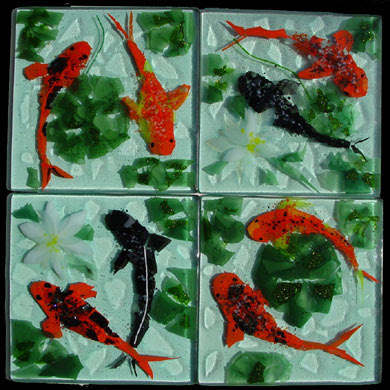 They make tile with it for starters and they also make mosaics using these fused glass tiles. Their work is arrestingly distinctive. Their floral and scenic mosaics take on an impressionist air without stooping to mimicry. This is clearly 21st century art and the point of view is definitely the Snyders. On first glance, this back splash appears to be a painting. But up close you can see how it's made. It's remarkable. These works are the product of two minds of rare vision and skill. This has been made in sections, panels the Snyders call them, and then fit together on site and then grouted into place. These poppies just jump off the wall here. 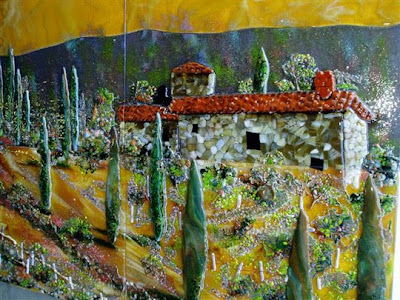 The way that the glass has been layered and melted makes it appear to have been painted with a brush. Believe it or not, this is a curved, glass tile wall. These individual tiles come together to make this mural and the key word is that they are individual tiles. 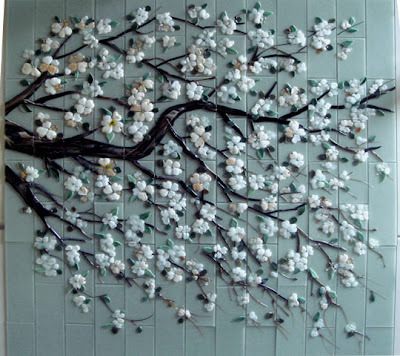 Each piece has a job to do as they come together to make up these dogwood blossoms. 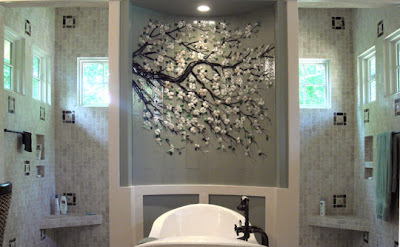 These dogwood blossoms also show off the relief possible with their technique. Keep in mind that these are installed as individual tiles, this not a wall with a relief applied to it. The detail shot above shows the individual pieces of the wall more clearly than the panoramic photo. Notice the variation of the flowers. This is an individual accent tile. I swear, that water seems to be moving. And here's a cluster of four, smaller accent tiles. Fantastic! 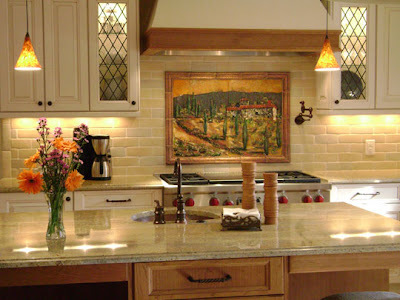 The Snyders make fused glass panels, mosaic tile, furniture, lighting, fine art and vases. 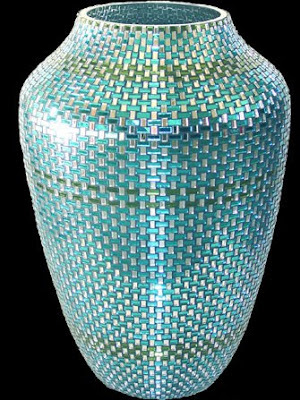 The vases are Tom's handiwork primarily and they are made from thousands of individual mosaic tiles. Tom's a mathematician and the math embodied in his vases proves my theory that art and science (or math in this case) aren't in opposition at all. In fact, I say they're the same thing. I am in awe of the mind that figured out how to make these. Think about it, these are squares and rectangles that wrap and interlock perfectly over a curving shape. When the curve widens, the pieces have to get larger. When the curve narrows, so do the tiles. Pulling this off in a solid color would be daunting enough. Using a complex pattern and then executing it perfectly is awe inspiring. Wow Tom. Wow. 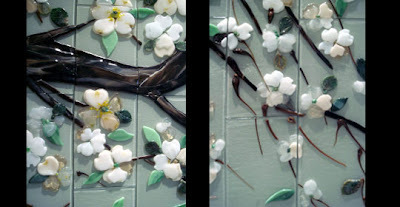 The Snyders' website, Designer Glass Mosaics is filled with wonders beyond what I'm showing you here. Please go over there and look around. You'll be amazed. I am drooling. The vases are spectacular, too. Paul, those are exquisite! Wow! Artfinders: Welcome! I am in awe of the work these people produce. Susan: Yes, yes, a thousand yesses. It would be worth a trip to Charlotte to see their studio. I like to think I'm pretty up on what's out there Elizabeth, but I have never seen anything like this before. I am hyperventilating over that poppies piece! Good god! I love the gestural quality of that one to. The precision of those vases stands in real contrast to those poppies and together they represent a range of expression that's pretty staggering.